Hotel OLYMPIC is a newly built traditional 3-star hotel in the city of Delphi offering panoramic views of the Corinthian Gulf and the olive Amfissa is open all year. 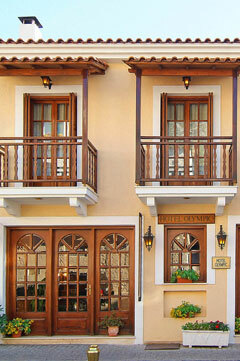 The hotel is 20km from the ski center of Parnassos and 1 km from the museum of Delphi. The hotel features comfortable and elegant rooms and suites with bathroom air condition, heating, hairdryer, telephone, TV, refrigerator and balcony with fantastic views. Customers available Bar, breakfast room, lounge with TV option for free internet (wifi) and a fireplace can guarantee a pleasant stay. Welcome to Olympic Hotel online booking system.